That’s according to a new economic report commissioned by the Irish Duty-Free Alliance. THE RE-INTRODUCTION OF duty-free on air and sea routes between Ireland and the UK after Brexit could inject an extra €45 million each year into the local economy. That’s according to a report commissioned by the Irish Duty-Free Alliance (IDFA), a lobby group that represents stakeholders in the local travel retail market including airports, airlines, ferry operators and retailers. At the turn of the millennium, the European Union abolished duty- and tax-free sales on all air and sea routes within the trade bloc. With Britain set to leave the EU in early 2019, the IDFA – which is spearheaded by DAA-owned Aer Rianta International – has called for the restoration of tax-free sales between the UK and the remaining 27 member-states. According to a return on the Register of Lobbying, the IFDA has lobbied numerous TDs, senators and MEPs on the matter in recent months. The new study, authored by DCU economics professor Anthony Foley, suggested that the restoration of duty-free sales between Ireland and the UK alone could lead to an extra €45.4 million in annual travel retail sales, excluding airline revenue. The change would also support another 450 jobs in the country, the analysis found. Foley said in the study that existing information on retail sales at airports and ports was obtained for the report but “to preserve commercial confidentiality broad summary statistics are used”. The report also assumed that the average departing UK passenger would roughly double their retail spend to about €11.30 if duty-free was re-introduced. Despite fluctuating inbound travel figures, the UK is still the largest single national market in Irish aviation and sea travel, accounting for about a third of all departures at Dublin Airport, Ireland’s busiest transport hub. Unsurprisingly, the capital’s airport would experience the biggest bump in extra retail sales if UK-EU duty-free was reintroduced. 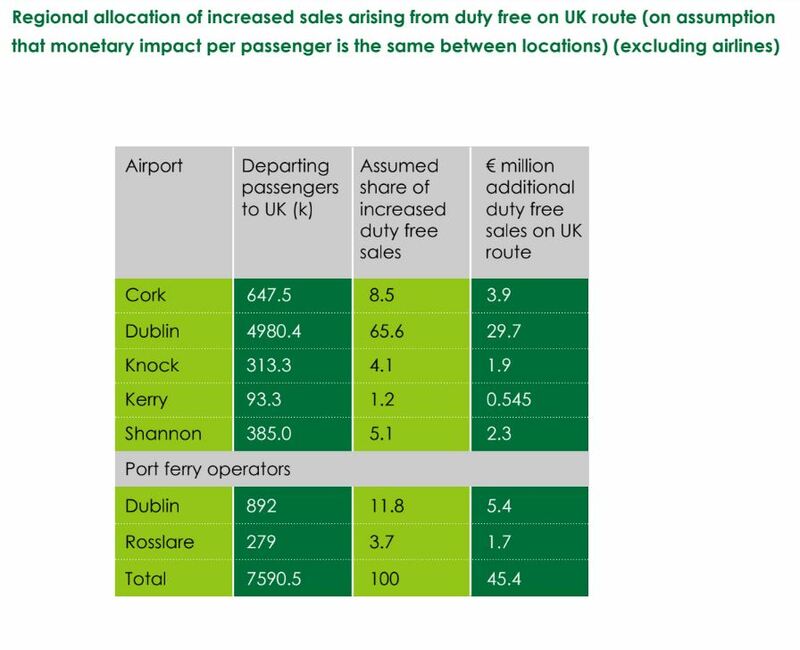 According to the IDFA, Dublin Airport is estimated to rake in an extra €29.7 million on UK routes, while Dublin ferry port would likely generate an additional €5.4 million. Cork Airport would generate €3.9 million, Shannon €2.3 million and Knock €1.9 million. Sales at Rosslare ferry port would be topped up by €1.7 million. The report’s author acknowledged that if duty-free was re-introduced, the Exchequer would lose the VAT and excise receipts currently paid on UK passenger departures. It’s estimated that about €12.1 million was collected in excise and VAT on UK routes. The return of duty-free would generate about €11.9 million in income tax, PRSI, VAT and other taxes. 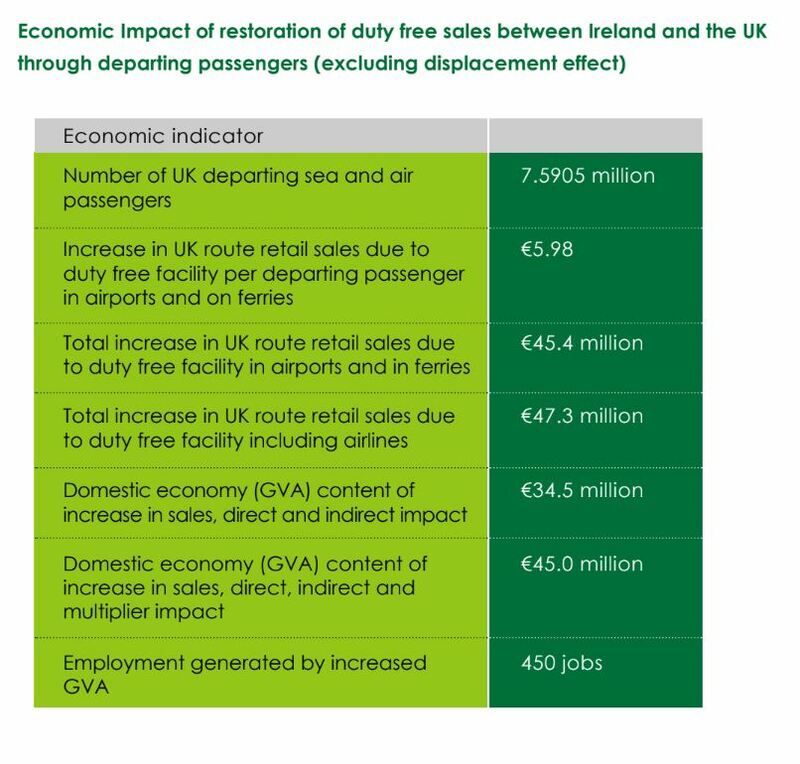 The study also suggested that the return of duty-free might have a positive impact on UK visitors’ perception of Ireland in terms of value for money. “At present one of the last impressions on the millions of departing UK visitors is the very high alcohol and tobacco excise coupled with the relatively high VAT rate,” the report said.